Ossila’s pre-patterned ITO substrates are used for a wide variety of teaching and research devices (both organic and inorganic) where a high-quality ITO surface is required. Fabricating devices using these substrates is designed to be quick and easy. In this guide, we demonstrate how to make standard OLEDs and OPVs. We've tried to include every detail that we can in this manual so that you can produce efficient devices with as little effort as possible. For the reference devices described here, there are seven basic steps that take you from substrates to devices ready for measurement. These steps are identical for both OLEDs and OPVs (with the exception of the active layer). Within this guide, you will find detailed information on each of these steps along with any additional know-how that we have generated which enables better fabrication. Ossila's substrates require a simple pre-cleaning routine to remove dirt and dust and create a pristine and hydrophilic ITO surface. 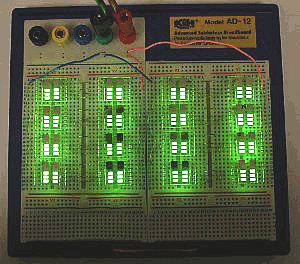 Each substrate has six individual pixels and a cathode connection strip. Deposit the hole transport layer (for example PEDOT:PSS) and then wipe free the cathode strip afterwards. 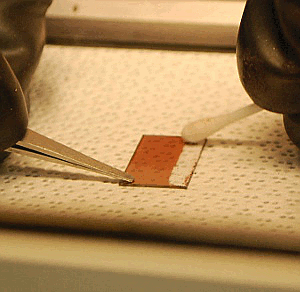 Deposit the active layer on top of the hole transport layer - and again, wipe the cathode clean. 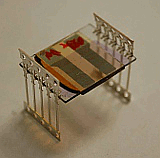 At this point either an OPV or and OLED can be fabricated simply by using different solutions. 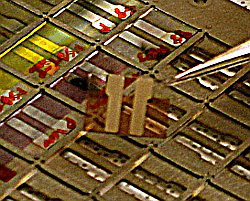 Use an Ossila cathode mask to deposit the cathode strips by thermal evaporation or other techniques. These connect the device pixels to the ITO cathode strip which are used to make an electrical connection. With Ossila's encapsulation system, devices can be stored for extended durations with minimum degradation in performance. This is ideal for testing devices under ambient conditions. Simply place a drop of our UV-cured epoxy on the device and place the glass coverslip on top before curing in a light box. 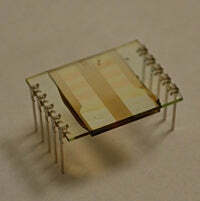 By adding connection legs with a standard 0.1" (2.54 mm) pitch, devices can be inserted into most prototyping boards, allowing electrical connection to the six individual pixels. Alternatively, by using Ossila's Push-Fit test boards each device can be characterised without the need for connection legs, speeding up the measurement process. We provide simple electrical test boards with push-fit connections to allow you to measure all of your devices in the fastest possible time. 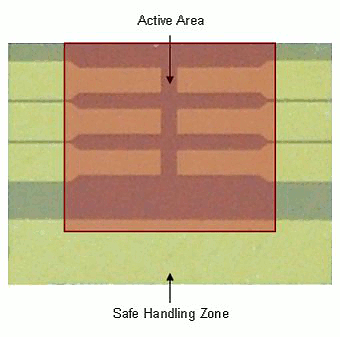 There are ZIF test boards as well when using electrical connection legs. We also provide aperture masks which fit over the substrates and have six electrochemically-etched holes above the pixels for more accurate definition of the active area - ideal for OPV measurements in solar simulators. Please read all relevant Material Safety Data Sheets (MSDS) and create a Risk Assessment for this process before commencing fabrication. In general, care should always be taken when handling the glass substrates as they are relatively thin and can potentially be broken, creating sharp edges. Sodium hydroxide (NaOH) solutions are used during the cleaning processes, and proper personal protective equipment should be used. Care should also be taken to ensure all personnel are aware of how these solutions should be created and disposed of. Special hazards include the exothermic reaction of sodium hydroxide pellets with water when making stock solutions (NaOH should always be added to water and not the other way around), and also the fact that the NaOH solutions should never be disposed of with solvents. Ossila’s photovoltaic inks also contain chlorinated solvents and should be used with proper fume extraction alongside the proper personal protective equipment. In general we fabricate in a class 1000 cleanroom to produce results with as high a consistency as possible. However, OPVs and OLEDs are relatively tolerant to dust, as it is insulating and generally only stops the device working where the dust has landed on the surface (leading to black spots for OLEDS and dead spots for OPVs). As this is typically a small fraction of the active area it is therefore possible to fabricate outside of a cleanroom so long as some care is taken. However, one particular problem is that dust can change the surface-wetting properties where it has landed on the substrate -- leading to pinholes and therefore shorting of devices. This is particularly relevant when spin-coating of PEDOT:PSS on the ITO which needs to be in pristine condition. 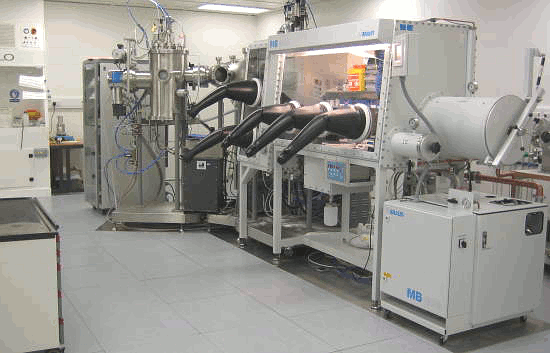 A cleanroom, including a glovebox. Processing without a glovebox is also possible but does cause some issues which need to be considered. Thin films of PEDOT:PSS are hygroscopic and absorb water very easily from the atmosphere, which leads to phase separation of the PEDOT from the PSS which degrades performance rapidly. The active layer can also be degraded by oxygen and water, especially in the presence of light. Processing under low-intensity red light significantly improves the stability of thin films of active layers, but it is still essential to minimise the exposure time. Reactive interface layers such as calcium must also be avoided when processing in air. One of the most important factors in a fabrication run is the handling of the substrates. Substrates should generally only be handled with tweezers. Care must be taken to avoid touching the active areas, as this will scratch the films and cause failures due to shorting of the anode and cathode. The diagram below shows the active areas in red which must not be touched by the tweezers as well as the safe handling zone. The green areas show where a device can be handled without affecting device performance. It is also essential the substrates should be kept the right way up. Even though a surface may appear physically clean, this is not the same as a surface being chemically clean. Where the active surface has been in contact with other surfaces (even clean surfaces such as cleanroom tissues) this typically leads to device defects. This is most visible when making OLEDs where dark spots occur, but equally affects the performance of OPVs. As such, substrates that have been dropped and landed active face down should be discarded to ensure device data is not affected. For easiest handling of substrates we recommend using 2A-type tweezers with rounded noses such as below. Type 2A tweezers, available from Ossila. IMPORTANT: OUR SUBSTRATES NO LONGER HAVE A PHOTORESIST COATING. Please note that these substrates are now packaged in clean room paper instead of the protective photoresist coating of older batches. 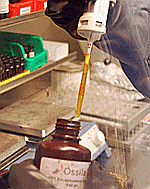 However, the same strip/cleaning routine developed will still work, because the sodium hydroxide (NaOH) routine will both help remove any dust and also provide a hydrophilic surface without the need for a plasma or UV clean (note that some materials/solutions particularly close to the wetting envelope may still benefit from a plasma clean). The exact strip routine was dependent upon the power and temperature of the sonic bath, so getting it right was overly time-consuming. Many users kept the substrates for a long time (sometimes years) and we found that the photoresist became slightly harder to remove over that timescale. If exposed to excessive heat, the photoresist could become plasticised and stick the substrates together. We hope this change is of benefit to you and we will be updating the fabrication guide soon as the pictures below still use the photoresist coated substrates. As always though, if you have any comments or questions please do not hesitate to contact us. Ossila's pre-patterned device substrates are made from the same ITO-covered glass panels used in the display industry to ensure that the ITO is of extremely high quality and defect-free. To preserve the quality of the ITO surface during shipping and storage it is shipped in clean-room paper. This means that a simple cleaning routine, which can take as little as 20 minutes, can be used to provide a pristine ITO surface without the need for plasma ashing of the substrate. The first step is to load the substrates into the cleaning rack such that they all have the same orientation. To identify the ITO side simply look at the edge of the substrate at an oblique angle - the ITO should be seen to go all the way to the edge when facing towards the viewer. If you are unsure, you can use a multimeter to measure the resistance across the ITO surface, which should be low due to its conductivity. Guide for determining the substrate orientation. The loaded substrate rack is submerged in a beaker with 1% (by volume) Hellmanex solution in hot (boiling) water. This is to remove the majority of contaminants, such as dirt and dust. The breaker is placed into a sonicator filled with boiling water from a kettle and sonicated for five minutes. After sonication, the substrates should be thoroughly rinsed with water. This can be done by either: placing them under a running tap, or submersing them in at least two consecutive beakers of water (dump rinses). The loaded substrate rack is then placed in a beaker of isopropyl alcohol (IPA) and sonicated for 5 minutes, using the same hot water that is remaining in the sonicator. This is to remove any remaining organic residues. Again rinse thoroughly with water as mentioned above. Finally, to finish cleaning and ensure a hydrophobic substrate surface, the substrates are sonicated in a 10 wt.% solution of sodium hydroxide (NaOH) in water. *Note that extra care must be used when handling hot NaOH solutions, and of course personal protective equipment should always be used. 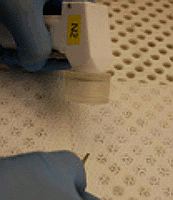 Cleaning in NaOH using a substrate rack. When rinsing, rinse first with hot water and again with cold water. Keep the substrates immersed in water until ready to blow dry in order to avoid contamination by dust. Rinsing the substrates in deionised water. When blow drying, always hold the substrates down at the edge on the cathode side and blow the nitrogen towards the tweezers so that any dirt on the tweezers does not re-contaminate the active area. Blow drying a substrate with N2. *To prepare a 10% by weight solution, dissolve 100 g of NaOH into 900 g (900 ml) of water to give a total solution mass of 1000 g.
Acts as a hole only (electron blocking) transport layer. Getting a high quality PEDOT:PSS film is critical for effective device performance and is often the most difficult part of device fabrication. PEDOT:PSS requires a pristine and hydrophilic surface in order to coat properly, which should have been achieved with the cleaning routine above. It is also critical to ensure that the active areas have not come into contact with any other surfaces as this will affect how well the ITO will spin. The grade and composition of PEDOT:PSS is also very important. We use Heraeus CleviosTM P AI 4083 which is filtered prior to use through a 0.45 μm PES filter. Note that it is very important to use a rubber-free syringe as many rubbers are attacked by the acidic nature of the PEDOT:PSS. Syringing out PEDOT:PSS using a PES filter and solvent-safe syringe. For typical use in OLEDs and OPVs, we spin coat the PEDOT:PSS at 5000 - 6000 rpm for 30 seconds to produce a film thickness of 30 - 40 nm. 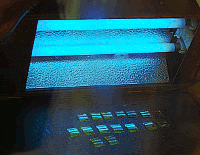 To minimise material use this can be done by pipetting 20 to 30 μl into the middle of a spinning substrate. After spinning has completed, visually inspect the PEDOT:PSS films for defects. For best performance discard any substrates with imperfections near the active pixels. Applying PEDOT:PSS using a Spin Coater. After spin coating, wipe the PEDOT:PSS off the cathode with a cotton bud soaked in DI water. Dab the cotton bud on a clean wipe first otherwise excess water can spread across the device and spoil the layer. We also find it useful to number the under-side of the substrate at this point with a permanent marker for later substrate identification. Then place the substrates either in a box with the lid closed to avoid dust settling on devices, or if kept in air for more than a few minutes place directly on a hotplate. Wiping the cathode clean using a cleanroom swab. For best performance the PEDOT:PSS should be annealed on a hotplate. We have tried making devices with different PEDOT:PSS annealing times from 1 min to 1 hour and temperatures from 75 to 180°C and demonstrated that initial performance is not affected by this regime so long as the devices were stored in a glovebox during this time. As such, a quick anneal of 5 min at 150°C is used for our standard processing in order to remove any residual water. However, once spun, it is critical to minimize the exposure of the PEDOT:PSS thin films to air as performance will rapidly degrade. The films are stable while on a hotplate and also while inside the glovebox, however, when exposed to ambient conditions they undergo what is assumed to be a morphological change due to solvent annealing from moisture in the atmosphere and resulting in an insulating PSS rich layer at the surface which significantly degrades performance. Anealing the substrates and then putting them in vials for transportation to the glovebox. The active layer can be applied either in air or in a glovebox with little difference in performance provided exposure time and light levels are minimised. However, in general spin coating in a glovebox ensures more controlled conditions. The deposition conditions of the active layer depends on the type of solution, however as a standard reference solutions we typically use the below solutions. Ossila M104 (P3HT) with M111 (PCBM). Pipetting 20 μl of the above solutions onto a substrate spinning at 2000 rpm should provide a good even coverage with approximately the desired thickness. The substrate needs to be spun until dry, which is typically only a few seconds — 15 seconds should be ample to achieve this for the above solutions and any other solutions based on toluene, chlorobenzene or chloroform. However, solutions based on dichlorobenzene or other high boiling point solvents may need several minutes of spin coating to dry fully. Spin coating the active layer. 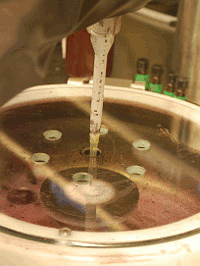 Following spin coating, the samples can be solvent or thermally annealed if desired. For the OLED reference solution we would recommend thermal annealing at 80°C for 10 minutes. For the OPV reference we would not recommend thermal annealing before cathode deposition. Before cathode deposition, the cathode strip needs to be wiped clean. A cotton bud dipped in solvent (chlorobenzene/toluene) is used to do this. Make sure the cotton bud is not too wet as the solvent will wick across the film. Cleaning the cathode with a solvent-covered swab. Finally, the substrates need to be placed face down in the evaporation shadow mask with the cathode strip at the wide end of the apertures. This is the only time the substrates should be placed with the active face down. Placing the substrates in a cathode deposition mask. Cathode evaporation is in general the trickiest and most failure prone part of the fabrication process. We find that aluminium gives the best performance for the OPV reference solution used here and Ca/Al for the OLED solution. However the evaporation of aluminium is notoriously difficult as not only is molten aluminium highly reactive but it also tends to wet the sides of the crucible to the extent that it flows over the rim and corrodes the heating element. However, with a good evaporation procedure which minimises the volume and temperature of the aluminium in the crucible these problems can be minimised so that the heating element and crucible can be re-used many times with good reliability (our record is 49 evaporations from one crucible/heater). A new crucible/heater (left) and an old crucible (right) where the aluminium has escaped over the side and corroded the heating element. We have used several evaporators with the crucible and heating element dependent upon the power sources and the throw (distance between the crucible and sample). 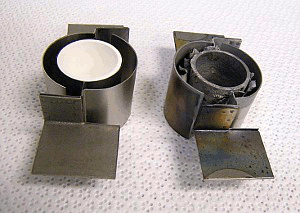 However, we find that boron nitride crucibles with tantalum heating elements provide good reliability for larger evaporators and tungsten filaments work well for small evaporators. Typically, we evaporate 100 nm of aluminium at a rate of around 1.5 Å/s, but thinner cathodes (50 nm) have also been used with no decrease in initial performance noted. The deposition rate can also be increased but this also increases the likelihood of the aluminium getting onto the heater and damaging it. It may take a little practice to get an aluminium evaporation working well, however, once a good procedure is in place it should be possible to get many evaporations per crucible and heater. Calcium evaporation is relatively trivial as it melts at low temperatures, however it can only be used effectively in conjunction with a glovebox otherwise degradation occurs. While working OLEDs can be made without calcium, its presence significantly improves performance, as it also does for thicker films of P3HT:PCBM (>200 nm) and for all devices based upon PCDTBT. After cathode deposition, thermal annealing can be performed if required. For the reference solution of P3HT:PCBM annealing at a temperature of approximately 150°C for 15 minutes gives optimal performance. Note however, that there is often a discrepancy between the hotplate readout and the actual surface temperature of up to ten degrees, so this is worth calibrating carefully. Also be careful when removing the samples from the hotplate as at this temperature they can melt gloves and cleanroom paper. Encapsulating the devices protects them against degradation by oxygen and moisture once removed from the glovebox. True encapsulation for lifetimes of thousands of hours requires the use of glass welding technology and/or getter layers of calcium. 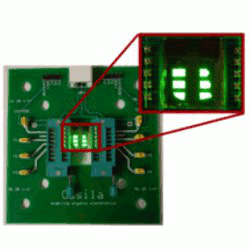 However, Ossila has developed a quick and effective way of encapsulating devices for lifetimes of several weeks or months under ambient conditions by use of a specialised epoxy. Encapsulating the device using coverslips and encapsulation epoxy. Ossila's UV curable epoxy has been specially selected to provide effective encapsulation while avoiding damaging the polymer or cathode underneath it during the setting process. By using this epoxy to bond a glass coverslip on top of the substrate Ossila’s substrates can be used without degradation over the course of several weeks. Curing is achieved by using a low power UV light of 380 nm over the course of about 30 mins. 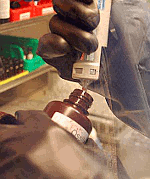 Note that if using the epoxy in a glovebox then it must be given several days to outgas any absorbed oxygen/water before being applied to sensitive layers such as calcium. The highest performing devices are produced by encapsulating after annealing has been done. However, encapsulation can also be done before annealing with only a small decrease in performance and allows for measurements to be made outside the glovebox at different annealing times and temperatures. To encapsulate a device, simply use a pipette tip to deposit a single drop of the UV curable epoxy onto the middle of the cathode and then place a coverslip on top of it. Over the course of about 30s or so the encapsulant will spread out under the coverslip, and after checking for voids can be placed in a UV light box to set. You can view a video demonstration of this process on the Encapsulation Epoxy product page. Attaching legs to devices enables easy and repeatable measurements using Ossila's zero insertion force (ZIF) sockets. The legs can be attached by placing them on a flat surface (clip side up) and then placing the substrate vertically on the clips before gently pressing down such that they engage. Note that the ITO fingers of the pixels and the cathode must align with the legs. This step can then be repeated for the other side of the substrate. Visually inspect the legs to check their alignment with the ITO as misalignment can cause measurement errors as more than one pixel will be active at once resulting in an artificial doubling of performance. Attaching the connection legs to the substrate. Note that extra care should be taken when engaging the substrates in the legs and only gentle pressure should be applied as there is the potential to break the substrate. After the legs have been attached, the bottom and top of the legs must then be removed. This can be done with a sturdy pair of scissors while the top can be removed by holding the substrate in one hand with the thumb and fore-finger and gently bending the top until it snaps off. Finishing the legs by cutting the bottom off. Ossila's ZIF sockets allow easy measurement using a variety of test equipment via the BNC connector. Simply raise the arms on the ZIF socket and place the substrate in. Lower the arms to make electrical connections and then select individual pixels using the micro-switches on the board. For OPVs we recommend the use of an Ossila measurement aperture mask for increased accuracy. This can simply be placed over the top of the device and has an electrochemically etched hole that defines the active area. Note that most organic photovoltaic devices undergo their most rapid degradation in performance when first illuminated (so called burn-in). Using a bread board to test device efficiency. A new device measured in air. Measured using an Ossila test board.